The Karst Research Group (KRG) consists of an interdisciplinary set of faculty and students working on a range of karst studies. Specific areas of interest include coastal cave and karst, paleoclimate and paleoenvironmental reconstructions based on cave deposits, karst hydrogeology and geochemistry, cave mineralogy, and GIS/mapping. Our research spans the globe (Spain, Romania, Sardinia, Caribbean basin, Central America), yet focuses on many issues that face residents on karst landscapes in our community. 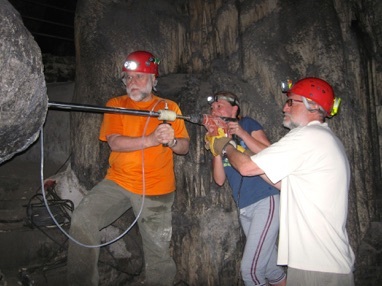 Karst research opportunities in our department exist for undergraduate and graduate level (both master and doctoral).